The conflict between the FARC and the Colombian government began in 1964, but political violence closely related to the current conflict began decades earlier. Colombia has never had much of a stable democracy. In its more than 200 years of existence, the former Spanish colony has had more than a dozen constitutions. These radical constitutional changes were partly due to a partisan division between Conservatives and Liberals, an ideological rift introduced by Liberator Simon Bolivar and his second-in-command, General Francisco de Paula Santander. Followers of the relatively conservative Bolivar with the support of the Catholic Church founded the Conservative Party in 1848 in response to the foundation of the secular Liberal Party, which was based on the British Enlightenment principles favored by Santander. At the time, the current Republic of Colombia had not yet been founded. The two parties were not just ideologically opposed, but were supported by and sometimes catered to distinct economically and politically powerful families. The current President Juan Manuel Santos, for example, is a descendant of independence fighter Antonia Santos and a grand-nephew of President Eduardo Santos. Attempts to consolidate political and economic power by these two powerhouses led to several violent confrontations, wars, and periods of political exclusion between the late 19th century and the 1940s. The violence with more radically leftist forces did not take place until after World War II, when a populist liberal politician, Jorge Eliecer Gaitan, opposed the Conservative government and really began moving the masses, threatening the status quo the Liberal Party and Conservative Party had long benefited from. Gaitan’s murder in 1948 sparked a period called “La Violencia,” a decade-long brutality in which more than 200,000 Colombians were killed. The less pragmatic, more ideological left wing of the Liberal Party, joined by communists and influenced by a wave of socialist revolts across the continent, did not accept this National Front. In the countryside, where inequality was bordering extreme levels, farmers began revolting against the Bogota-based political elite. From this movement sprung the Revolutionary Armed Forces of Colombia (FARC), who were initially nothing but a handful of peasants. In 1964, they declared themselves independent, forming The Republic of Marquetalia in a tiny village on the foot of the Nevada de Huila mountain range. The guerrillas’ first attack took place in 1966. For decades, the FARC remained active in the countryside and was of relatively little nuisance in the cities as the group lacked financing. The conflict escalated in the 1980s when several leftist rebel groups became active, drug trafficking revenue was financing weapons across the country, and right-wing self-defense forces began forming to protect private interests from the increasingly powerful and wealthy guerrillas. In hand with the Colombian Communist Party, the strengthened FARC began to have political ambitions at a national level, posing a serious challenge to the political status quo. In 1985, the Colombian government began peace talks with the different rebel groups and the FARC joined more moderate leftist thought leaders to form a political party, the Patriotic Union. Rebel groups M-19 and EPL decided to demobilize in 1991 after the government agreed to a new constitution. However, groups like the FARC and ELN did not demobilize and did not agree with the new constitution. The Patriotic Union — the rebels’ attempt to actively participate in politics — faced an extermination campaign by right-wing paramilitary groups and extreme elements within the state, particularly the military. Additionally, the government created bad blood by attacking a FARC compound in the middle of the talks. In turn, the FARC removed itself from politics and began an impressive territorial expansion, increasingly using the revenue from drug trafficking to fund their military campaign. The group had also discovered a new form of making money that also served as political intimidation, kidnapping. However, as the FARC in the mid-90s were approaching the gates of the capital Bogota from the south, state-aligned paramilitary groups from the northwest and east of Colombia united and formed the AUC and one of the bloodiest decades of the conflict began. 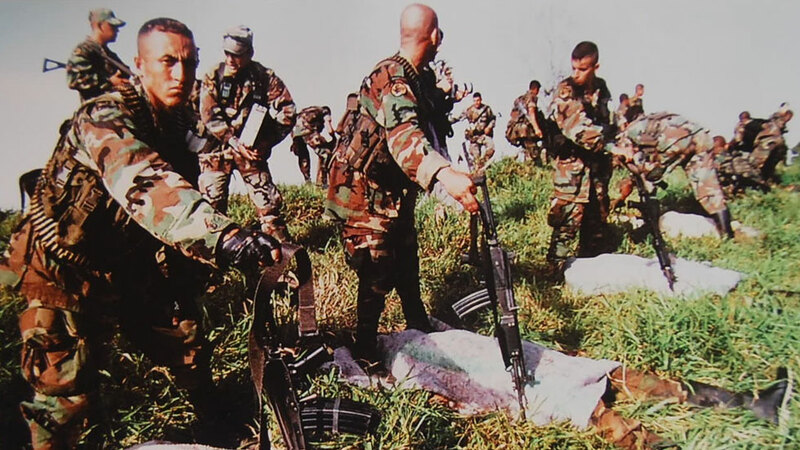 The state forces fighting the guerrillas were now supported by brutal paramilitary forces that began pushing the guerrillas back south while taking increasing control of the drug trafficking trade. However, in spite of paramilitary pressure in the north, the FARC was able to make major territorial gains in the south of the country and, financed by drug trafficking and “economic retentions,” or kidnappings for extortion purposes, the FARC was able to grow stronger, increasing their territorial pressure to the point they were putting up roadblocks outside major cities. Faced by the increasingly strong guerrilla group and an increasingly weak state, President Andres Pastrana (1998-2002) agreed to peace talks with the guerrillas in 1999 while obtaining US support for the military defeat of the FARC. Meanwhile, paramilitary violence surged and groups united in the AUC in 1997 carried out a brutal offensive, breaking victimization records while the Pastrana administration was negotiating with the FARC. The talks failed in 2002, and the military offensive supported by the 1999 Plan Colombia deal came into action. Following the talks, the Colombian people elected Alvaro Uribe, a hard-liner and Plan Colombia really came to full force. The Colombian military gained access to arms and intelligence and was also increasingly able to push the FARC deeper inside the jungle. However, the military successes claimed by the Colombian government of Alvaro Uribe and the US government of George W. Bush came with a major human cost; millions of Colombians were displaced. Tens of thousands civilians were killed or otherwise victimized. The US began pulling funds following a series of scandals and tens of thousands of human rights abuses and the Colombian military was left on its own. Additionally, the weakened FARC switched from the toxic territorial warfare with large armies to traditional guerrilla warfare using tiny units undetectable from the sky and easily hidden among the civilian population. The conflict seemed to have reached a stalemate as the military’s effectiveness dropped while that of the guerrillas went up. However, the Colombian government, under the leadership of former President Alvaro Uribe, began approaching the FARC after the demobilization of the AUC. These initiatives did not result in either informal or formal talks until current President Juan Manuel Santos took office in 2010 and, while still at war, began secret peace talks with the FARC in 2011 that resulted in the formal peace talks announced in 2012. Now, in the second half of 2016 these talks have culminated in a peace deal that will have to be ratified by Colombians, many of whom have not had the fortune to enjoy one day of peace.